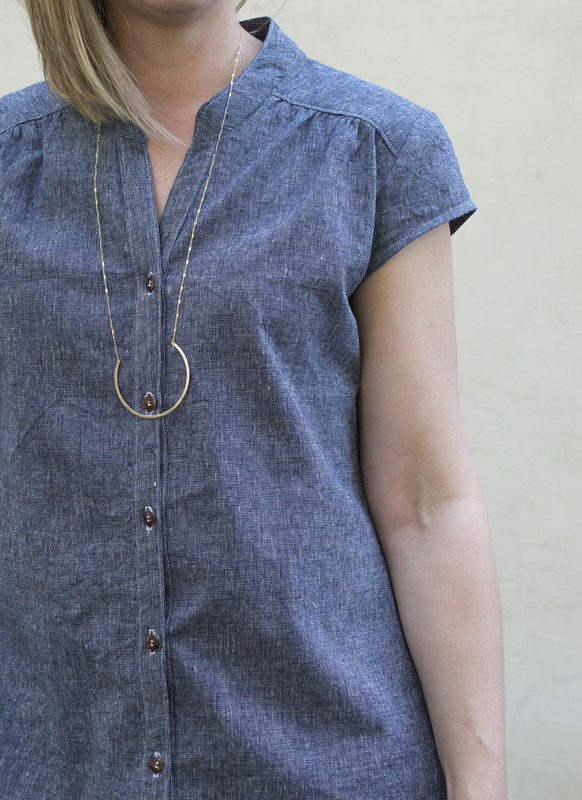 This easy-going chambray shirtdress is not the flashiest addition to my closet but it is probably the most versatile thing I have made all year and I am pretty excited about that. Sometimes you just need an easy-but-not-sloppy dress, you know? This is actually what I love most about this dress, it hits that sweet spot of looking a little bit dressy but not attention-getting and not stuffy. A dress for those days you aren’t on vacation but you need to be somewhere professional enough to shun yoga pants. A chambray shirtdress is a complete wardrobe staple and this dress is going to be driving all the miles with me. Pattern: This dress came straight off of my “hack nine” list from earlier in the year. It’s a pattern hack of the Marigold Dress from Blank Slate Patterns. I have quite the history of messing with this pattern. Years ago when I collaborated with Michael Miller fabrics, I hacked it two different ways, see here, and ever since then I have had the idea to use the stunning details at the collar and shoulders for a full shirtdress. It’s one of those ideas that kind of sat there nagging at my brain until I finally brought it to reality. And, I’m so glad I did. I am really getting my money’s worth with this pattern. Fabric: The fabric is a heavyweight chambray fabric, thicker than I’m used to for chambray. 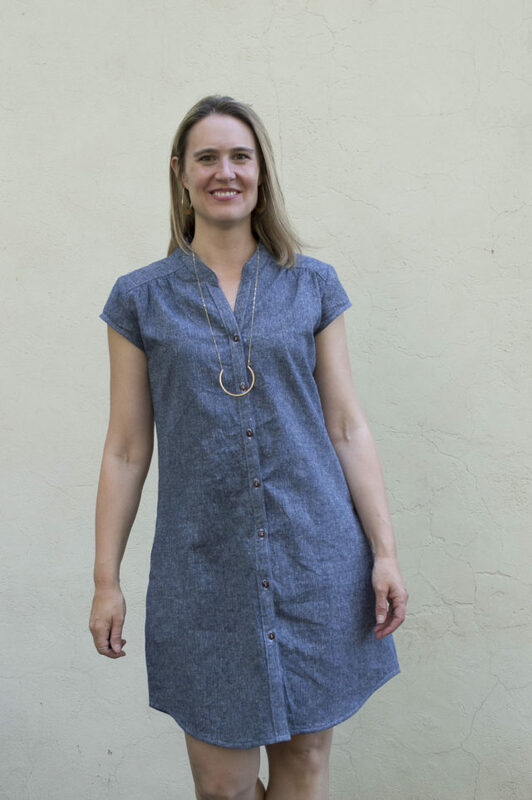 It works perfectly to give the shirtdress some structure although I can imagine a lightweight chambray would also be nice (albeit a more relaxed, casual look). Damn it, now I want one in lightweight chambray! Get back on track, Melissa. Yes. Ok. This chambray shirtdress fabric came from Imagine Gnats but I bought it probably a year ago so they don’t carry it anymore. It’s also got a nice texture and more dramatic white threads than other chambrays which gave the dress nice character. As for the pattern hacking, I took everything I did to the top of the original Marigold dress years ago to open up the collar and change the button location and then I added length and continued the button placket all the way down. As I added length I also altered the side seam outward to accommodate my hips. I didn’t, however, create a full a-line shape. I drew a gradual line outward from the waist that would work in the width and placement of my hips and then kept the line straight down from there. I also added a curved hem because I love a curved hem. I think that pretty much covers everything I did. I did make a muslin version before I cut into the real fabric, though. I had to be sure my quick sketches actually worked. In some ways it is amazing it took me so long to take this idea from my brain out into the real world. But, that’s is the thing with pattern hacking. There is always a chance that an idea won’t work and that means risking time and effort for something that might not be wearable. Phew, that can be hard to swallow and in the tiny pockets of time I get to spend sewing it can be difficult to convince my brain to take that risk. It’s hard to decide to undertake that effort when I could just pick up a perfectly good pattern someone else already figured out. The thing is, the creative puzzle of pattern hacking as well as the chance to make it just exactly how I want it is worth the effort. Every time I pattern hack I get a little bit better and give myself a creative license to try out a whole new idea. Plus, I stretch my dollars and stretch what one single pattern can do for me. I love that. I’ve discussed all of this before but pattern hacking is a combination of the best of a pre-made pattern and pattern making. I don’t have to start from scratch but I get to make it my very own. It’s a shirtdress, a simple and versatile one but it’s also a bit of a gift to my creative self. Do you pattern hack? What encourages you to go for it? What gets in your way? I would live in this. Looks fab!!! I only pattern hack occassionally because most of my sewing time is testing or gifting. It is the best feeling when it actually works though!! And it gives me confidence when altering patterns like changing a neckline/facing. Yes! Even simple alterations are a confidence boost (when they work). The struggle for taking time to pattern hack or alter is a real one…I feel you. It’s why it doesn’t happen all that much but I’m trying to carve out the time for it. Or, more accurately, decide to undertake it when I do end up with time. Thanks for you kind words, as always, friend! I love your hack! The pattern’s forward shoulder seams and gathers are so cool, and as a dress it looks totally chic and effortless. This is really pretty! I have a chambray sheet set that would work well with this!